The Orpheum Theater in San Francisco features 6 to 7 of the biggest Broadway hits every season. This is where you can see acclaimed productions such as The Lion King, Hamilton, and Wicked. The Orpheum is also one of my favorite places to see a show in SF! In addition to enjoying what's on stage, I always love arriving a little early to take in the gorgeous decor and history of this amazing theater. These are the shows that are coming up soon at the Orpheum Theater San Francisco. Click the links for ticketing information. At times when certain shows are not sold out, you may be able to find tickets at a discount. 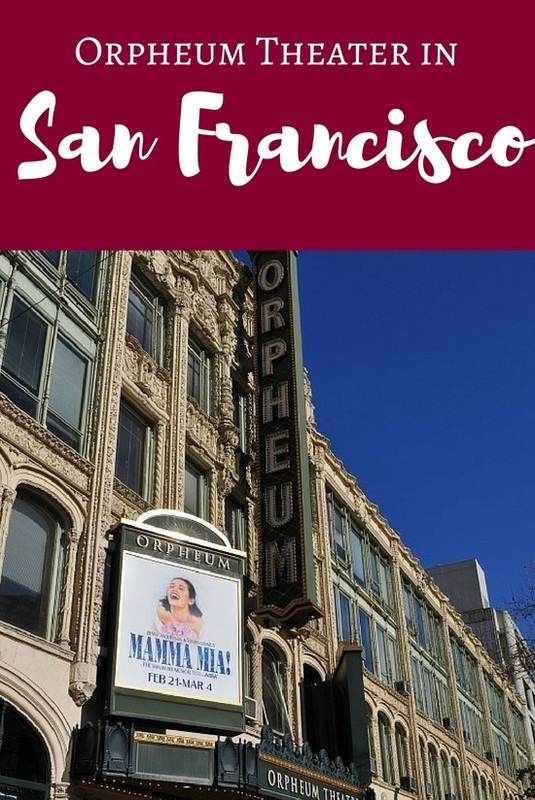 The following is a site I use all the time to find deals, so you can feel safe that these tickets to the Orpheum Theater San Francisco shows are real. Goldstar is the first place I look for tickets. They sell a variety of tickets to theater performances around town including those at the Orpheum Theater San Francisco. Their tickets are often at 50% off. You can also find advance tickets here for full price, but available before anyone else (except members) can buy them. Click here to visit Goldstar to see what tickets are available. San Francisco is a very casual town, so don't worry too much about what to wear to a show at the Orpheum Theater San Francisco. You will find most people in jeans or business casual wear. However, some people do like to dress up a little more, especially on opening night. If you have something that looks nice (including jeans and/or casual pants), you will fit right in. The reason I love this theater is that it was built in 1926 and it is rich in history. But, because the building is so old, one of its downsides is that there are very few restrooms. If you need to head to the restroom during the admission, get out of your seat as quickly as possible to grab your spot in line. I know this seems silly, but believe me, the lines (especially for women) are LONG and sometimes you might not be done before the second or third act starts. A little planning ahead, including finding the restrooms' location before you sit down, helps too! If you can, I highly recommend taking pubic transit, as the streets in this part of town can be tricky. They are busy and many are one-way. However, if you do decide to drive, you will find plenty of places to park. These are just a few spots nearby. Keep in mind though that many of them are quite pricey, so just make sure to add that into account if you plan to drive. SOMA Grand Parking Garage: 1160 Mission St.
City Park: Essex Fox Plaza, 50 8th St.
UC Hastings Parking Garage: 376 Larkin St.
Golden Gate Garage, Turquoise Parking: 64 Golden Gate Ave.
Turk Garage/Lot, Turquoise Parking: 67 Turk St. The Orpheum Theater San Francisco is easy to get to by public transportation. Here are just a few of the top options. There are two great options to get to the Orpheum Theater San Francisco from Fisherman's Wharf. The most popular option is the F Streetcar. These historic cars are fun to ride and drop you off right in front of the Orpheum. The second option is the 19 bus. You can pick it up on the western side of Fisherman's Wharf. It's faster, but isn't as fun of a ride. From Union Square, I recommend taking any of the light rail trains (outbound) to the Civic Center Station. You will pick them up at Powell and it's just one stop, so you can get on any outbound train. There are several great places to stay nearby. Here are just a few of my recommendations. Click here for recent guest reviews for these and other nearby hotels on TripAdvisor.com. Union Square is just a few blocks away from the Orpheum Theater San Francisco. Click here to find my hotel recommendations in this district. You're in the heart of the city and there are several great restaurants nearby. Here are just a few of my favorites. Built in 1926, the Orpheum Theater today is a San Francisco Historical Landmark. Its interior features an ornate vaulted ceiling, while the exterior is modeled after a 12th-century French cathedral. It is one of the largest venues in SF, seating more than 2,200 guests. The Orpheum is owned by SHN, a major SF theater production company that has brought many hit musicals from Broadway to its stage, and vice versa, over the years. The most popular pre-Broadway shows that have been staged here include Wicked, Bring It On: The Musical, Evita, Mamma Mia!, and The Act. San Francisco Theater District: Are you looking at enjoying several shows in SF? If so, then check out my theater district page. It will give you everything you need to enjoy the theater in SF. Click here for details. Golden Gate Theater: The Golden Gate Theater is another place to find Broadway shows in SF. It's just a few blocks away from the Orpheum Theater San Francisco. Click here to learn more and check out their schedule of performances. San Jose Theater: In addition to SF, you will also find several top productions in San Jose. They include shows such as Annie, A Christmas Carol, and so much more. Click here for this season's schedule. All SF Shows: This is where you will find an entire list of all the shows. It includes all of SF's performing arts venues, Cirque du Soleil, and more. Click here for details.